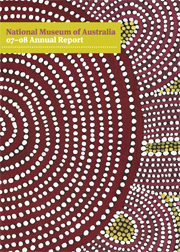 The National Museum's Annual Report 2007-2008 is available online in both HTML and PDF formats. Photography by George Serras and Lannon Harley, National Museum of Australia, unless otherwise acknowledged. Cover image: Kiritjinya, 1975, by John Tjakamarra, which featured in the Papunya Painting: Out of the Desert exhibition.